It should have been a simple journey - a drive from Minneapolis to Green Bay, Wisconsin. But a couple of unplanned detours lead Grace MacBride, Annie Belinsky and police Deputy Sharon Mueller deep in the northern woods, far from civilization and a mobile phone signal. Then the car breaks down. The nervous search for a landline and a mechanic leads the women to Four Corners, a sleepy crossroads town. And place they soon wish they'd never stumbled on - because something terrible happened in Four Corners. . . 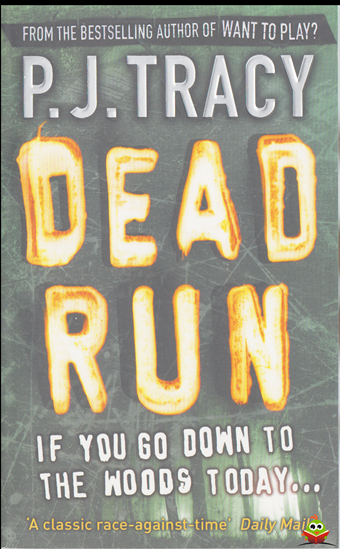 Filled with the same crackling dialogue, pace and rich vivid characters as in previous novels, Dead Run firmly establishes P. J. Tracy as one of the most exciting thriller writers in the world. Fans of Karen Rose should be paying attention. Follow the characters' journeys in the rest of the series: Want to Play?, Live Bait, Snow Blind, Play to Kill and Two Evils. P. J. Tracy is the pseudonynm for the mother-and-daughter writing team of P. J. and Traci Lambrecht. They are the authors of the award-winning and best-selling thrillers Live Bait, Dead Run, Snow Blind, Play to Kill, Two Evils and the Richard and Judy Book Club pick Want to Play?*. * All six books feature detectives Gino and Magozzi and maverick computer hacker Grace MacBride. P. J. and Traci both live near Minneapolis, Minnesota.